This is both frightening and enlightening work. It’s a fully-affecting performance in a fully-disquieting movie. As the story goes deeper and the situation becomes more desperate, we feel helplessly trapped in the downward spiral of dementia. Alice Howland is just fifty years old. The script emphasizes that her Alzheimer’s Disease is very rare for her age, but that disclaimer makes her situation no less hopeless, her story no less heartbreaking. 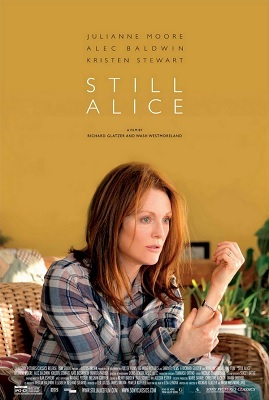 As Alice, Julianne Moore’s performance is so nuanced, so natural, so effective she forces us to ask ourselves: What would we do – what could we do – if this happened to us? Alice tells her daughter that she has good days, days when the only thing she forgets is that she has the disease. But the days we see are her bad ones; the story shows a condensed and concentrated version of a life filled with blank spots and emptiness and embarrassment. There are no big moments here, but there is sadness and even suspense in even the smallest ones; should she be allowed to cook? To hold her young grand-daughter? This is not a documentary, but it has the realism of one; it’s sad without becoming overly sentimental, instructive without being preachy. The filmmakers find devices to articulate factual and forthright information about this disease from various points of view and through situations that never feel contrived. The cast is as good as they need to be because this movie belongs to Moore; this is her most compassionate and searing performance. Through the brightness in her eyes, we see the confusion in her mind. As she pages through photo albums and relives memories of days gone by, we feel her desperate grasp for joys she know will soon be out of reach. And the recording she makes to guide her through the most degenerative phases of her situation is devastating. This is eye-opening, gut-wrenching, Oscar-worthy work. And if the ending is not typical of a “Hollywood movie,” its lesson is important: Maybe the only way we can deal with this most dehumanizing of all diseases is to show love.